China may have emerged as largest smartphone market in the world, but Chinese tablet shipment volumes are still modest. According to IDC, iPad shipments in China were 1.4 million in the fourth quarter of 2012, good for a 62 per cent share of the local tablet market. 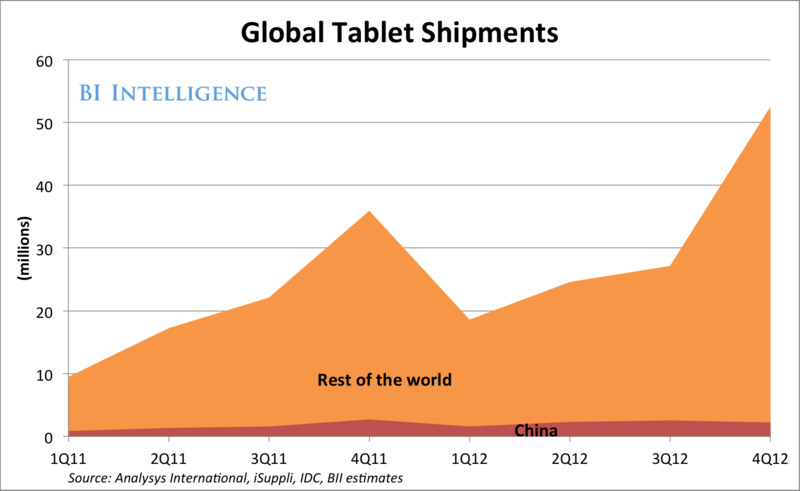 Extrapolating from that number, we can estimate that there were only 2.3 million tablets shipped in China last quarter. For all of 2012, we estimate that Chinese tablet shipments rose 34 per cent to 8.8 million units, or 7 per cent of global shipments. Given that prices in the Chinese market have been falling, driven by cheaper mini-tablets, the relatively modest growth numbers seem surprising. It is possible that tablets are being restrained by their distribution model. Unlike smartphones, there is not a natural retail outlet for tablet because you don’t necessarily need a wireless contract from a carrier. More likely, there is a massive grey-market of ultra-cheap Android tablets from local manufacturers that is flying under the radar of research firms. According to Ben Bajarin of Creative Strategies, Inc., these tablets are manufactured by no-name local brands, run a super stripped-down version of Android, and are usually sold in local shops or flea markets. Whatever the case, the Chinese tablet market is set for enormous growth, but it’s not clear international manufacturers will reap the benefits.